(In theaters, January 2002) From the plot description (In 1932 England, a rich industrialist is killed during a weekend-long hunting party), you might come to expect a comfortable murder mystery à la Agatha Christie. Robert Altman films are rarely about plot, however, and this one is quick to redirect our attention toward the real underpinning of these murder mysteries and in doing so illuminates some of the hidden engines of the genre. 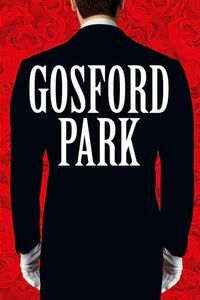 Gosford Park shows us, in detail, the divisions between servants and masters, and the small-army logistics of maintaining a small manor. Well before any crime is committed, we suddenly realise that the hoariest cliché of the genre, “the butler did it!”, is nothing short of a panicked cry of social despair from the aristocracy; not only are the commoners getting uppity, but they’re also killing the rich! Altman piles detail upon detail, with a Hollywood film producer, a bumbling police inspector, a clever servant girl, an impostor in both worlds, hints of scandals and lots more. It adds up to a long and quiet film, but a curiously entertaining one, with good performances all around. (Watch Clive Owen, and try not to imagine him as James Bond.) It’s much more than a murder mystery, especially given that the mystery isn’t that hard to solve.